Well, it's been a weird Eastern Conference Finals so far, and that hasn't changed in Game 2 despite the Pittsburgh Penguins ultimately prevailing with a 3-2 OT win. Anton Stralman returned for the Tampa Bay Lightning, and he opened the scoring for the Bolts with a blast past Murray's glove to cut the score to 2-1 late in the 1st period. Or did he blast a shot THROUGH Murray's glove? It's a topic that's raged across social media today, to the point where Dana Heinze, the team's equipment manager, tweeted out pictures of Murray's catching mitt. 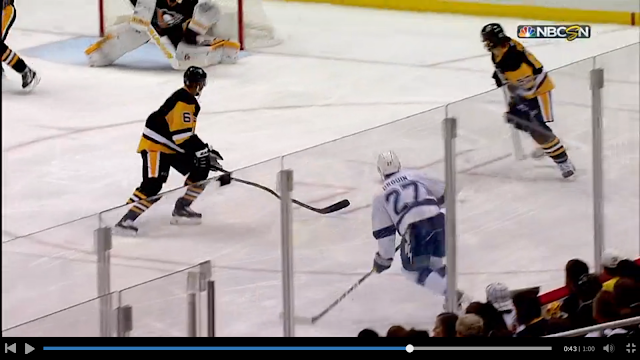 From this still, it certainly looks like the puck is inside Murray's glove. In fact, based on this picture alone it would appear that Murray made a great glove save, but as we all know the puck ended up in the back of the net. Now, based on this and Heinze's rebuttal that the puck went through, an argument could be made for a trick of the eye in the video replay. However, that's not where this story ends. 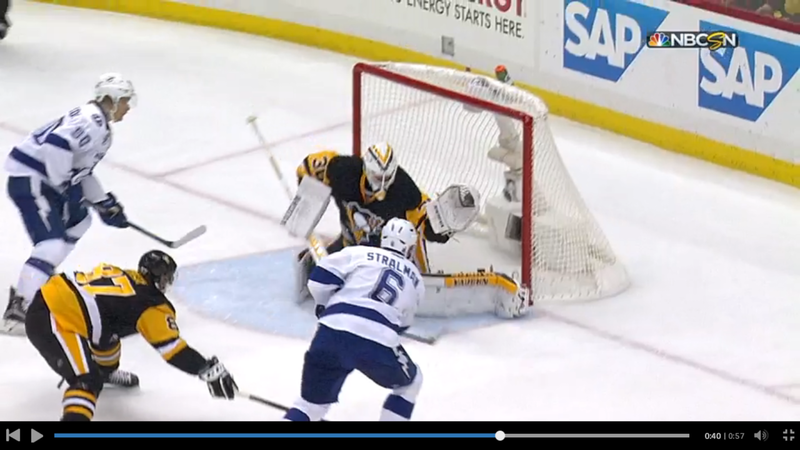 Take a close look at Murray's glove and blocker on the Stralman goal. The blocker is all white with a vertical "Vaughn" logo. Ditto for the glove. Fast forward to the 2nd period, and Murray has an entirely new blocker and glove on - one with a Pittsburgh gold trim to it. There's certainly more to the story than the team is letting on, and it would seem to be an unusual time to make an equipment change without an equipment malfunction. You can make the conclusion that you want, but based on the video evidence and the resulting equipment change, I find it impossible not to believe that Stralman's shot went through Murray's glove. Puck did not go thru glove. Just not possible. Not enough space in between lacing of Web. If it broke through there would have been loose laces hanging visible to see on TV and ref would have stopped game to allow for equipment change. Only 1 reason for Murray to change gloves between periods. It goes by many names but they all amount to the same thing. Call it luck, mojo,superstition, or whatever you want. The old glove had the stink of a bad goal/botched save on it. Murray changed gloves during intermission to change his MOJO. And it worked. Goalies are notoriously superstitious. Sometimes insanely so. What we saw with the equipment change was just a little peek into the psyche of a young goalie and what he does to forget a bad period. Nothing more.